… was better revealed in the light of day”. 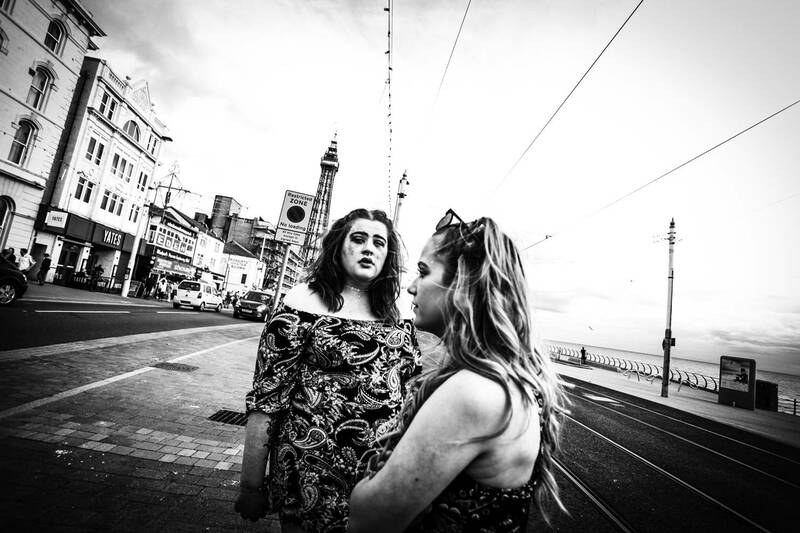 Benita Suchodrev about her photo series “48hours Blackpool”. Benita, please introduce yourself briefly. 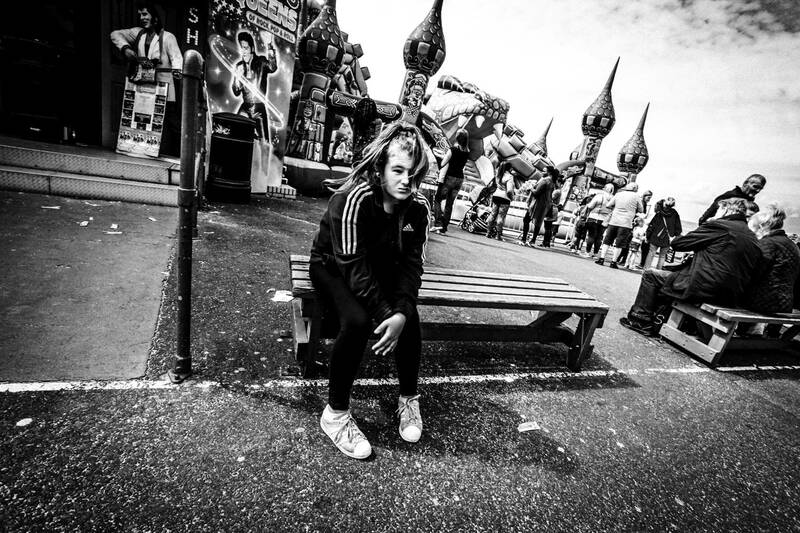 I am a Russian-American photographer based in Berlin where I have been living and working since 2008. 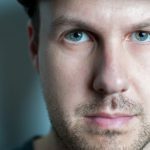 In the first few years following my relocation I extensively documented Berlin’s multifaceted art scene and nightlife, capturing the so called ‘Zeitgeist’ while working on diverse photographic projects. My portrait and documentary work has been exhibited in solo and group shows nationally and internationally. 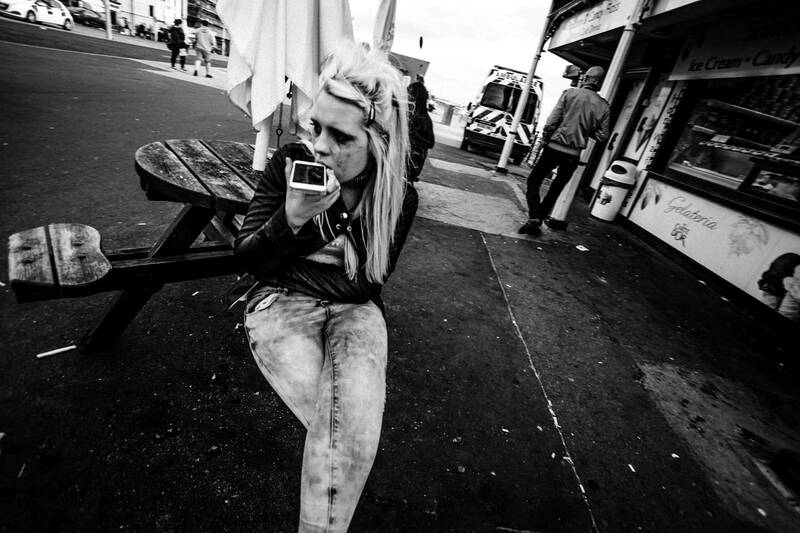 Your photo series was shot during a 48 hour visit to Blackpool. Why this particular city and not any other british seaside town? 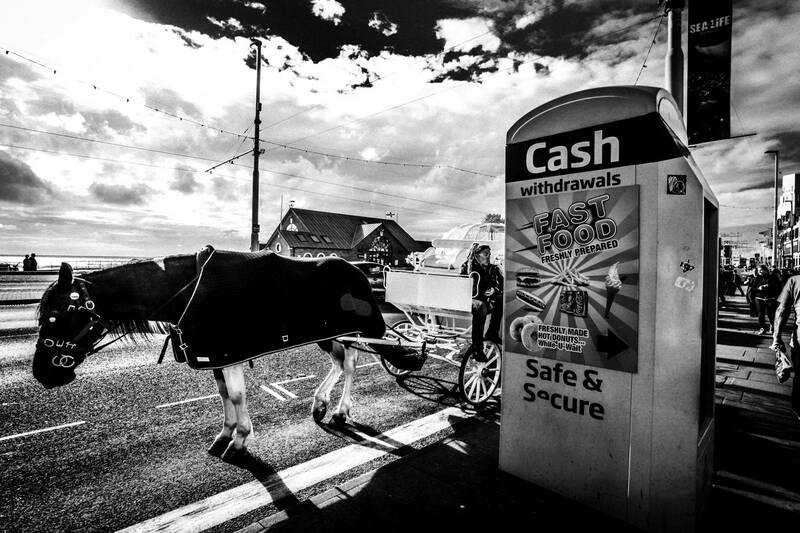 I journeyed to Blackpool following an invitation from a colleague who was planning a visit. I knew nothing of Blackpool and had no plans at the time to shoot in this or in any other British resort town. But when the opportunity to visit Blackpool presented itself, I knew it was the thing to do. It was a very spontaneous, intuitive decision. How did you prepare for your trip knowing that you have only limited time of shooting? I did not prepare at all. I had no expectations or preconceptions. With my camera equipment in tow I took a plane to Manchester and the train to Blackpool, not knowing what I was going to see or photograph. In fact, Rain was predicted, so I thought photographing the storm at sea would be my consolation; little did I know that the sea will only seldom appear in my pictures. 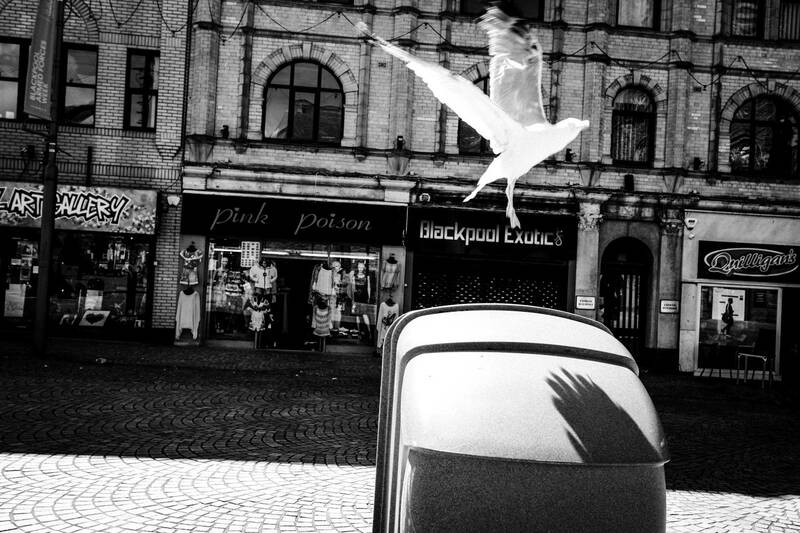 Blackpool was as anonymous to me as I was to it and that was a good thing. I had an open mind, worked without pressure, without obsessing; I just let myself to go with the flow and let life unfold before my eyes, before my camera. I strongly dislike limitations. Why worry about time running out and planning your shots when the best ones often happen when least planned or expected? I strongly believe that this kind of freedom and mental flexibility is what photographing on the street is all about. How did people react to being photographed? 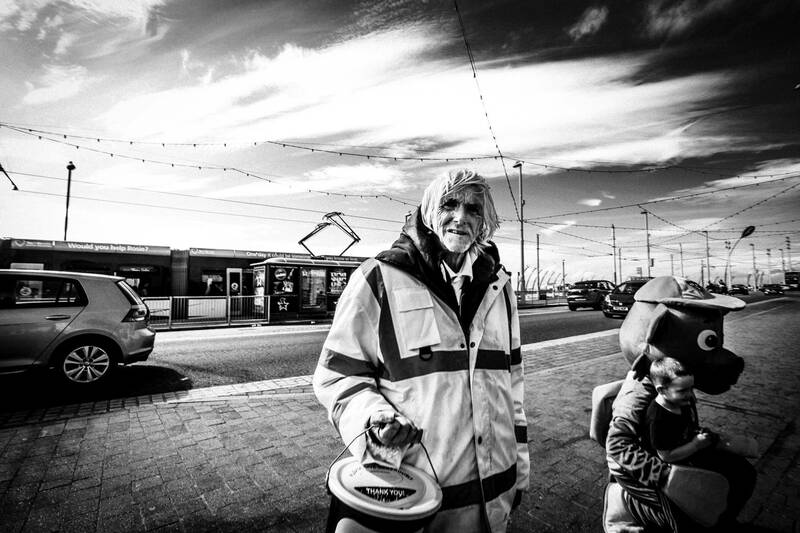 The truth is that in Blackpool people were so occupied with themselves and their activities that I was barely noticed, though I was probably the only photographer around. Going unnoticed is something that is quite rare in this day and age when everyone is so ‘camera aware’. But I also know how to shoot discreetly. I don’t hide my camera but I also don’t shove it into people’s faces… well, not unless I absolutely have to! What encounters have remained in your memory? The whole trip was one big encounter. 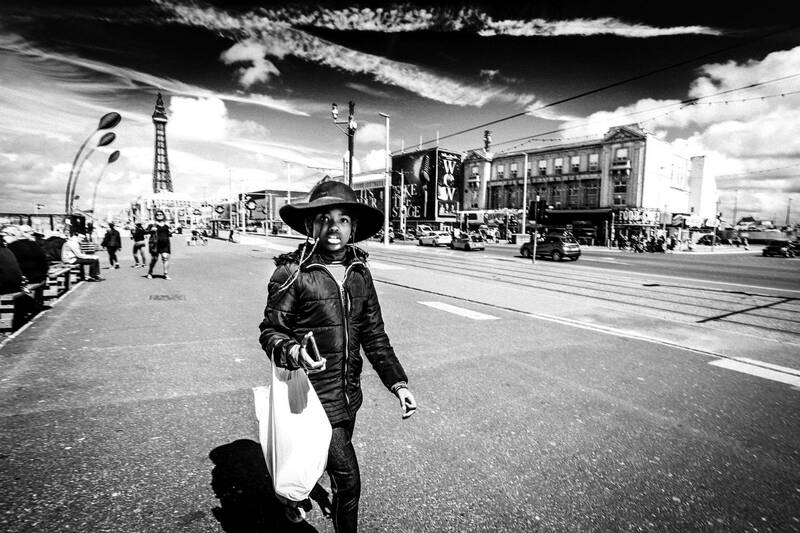 Blackpool struck me as a whimsical hybrid of Coney Island and Las Vegas, where Elvis Presley is still alive and a miniature version of the Eiffel Tower soars above the Irish Sea; a makeshift wonderland where the insatiable craving for wonder far exceeds the wonder itself. I was faced with flocks of young and old caught in consumption frenzy, eager to fit as many thrills as possible into the smallest window of time. Blackpool is after all a weekend getaway; a traditional destination for stag and hen parties and wacky characters. It is also a playground for kids with painted faces wearing candy-colored tops, gangsta hoodies, and fake tattoos, fervidly dragging their moms and pops (and vice versa) in and out, to and fro amusement parks, bingo halls, arcades, and restaurants. In this resort town, where crime and poverty rates make it a point of convergence for the cheerful and the destitute, I wasn’t looking for emptiness, distress, or alienation. But to my surprise I seemed to find it almost everywhere, in almost everyone. I discovered that the dark side of Blackpool was better revealed in the light of day. By looking at your portfolio, you are focusing on other photography genres as well. 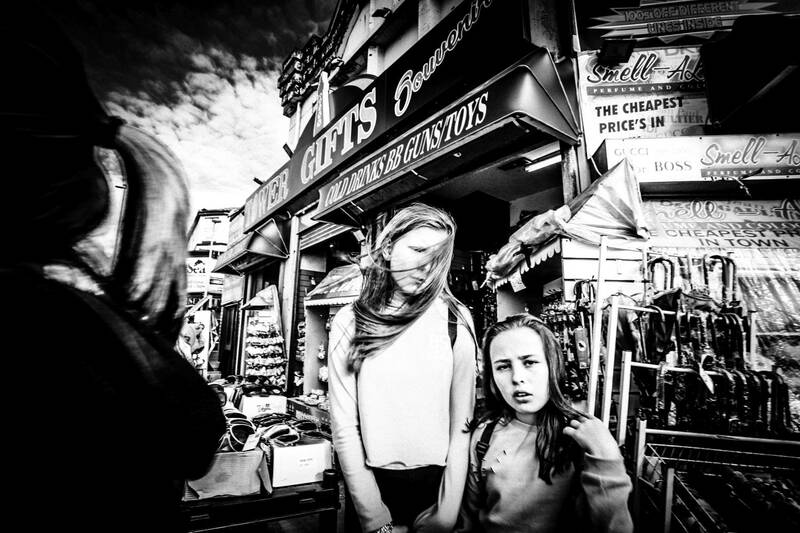 What is it that makes street photography so appealing for you? Documentary and staged photography are two different worlds. In staged photography I control the light, the angle, even my subjects. And even if I work intuitively, which I do, I end up staging the world in the picture. In documentary photography I have little influence. I shoot what comes at me, as it comes. I adapt to my surroundings, not make them adapt to me. I also find that in staged or studio photography light plays a crucial if not prominent role whereas in documentary photography LIFE is at the center. It may sound a bit like a cliché, but on the street you are hunter. You need ‘guts’ and you need to turn on your senses. On the street my camera is an extension of my hand; with it I reach out and grab the moment that I don’t want to let go of. I do not shy from confrontation. But building intimacy is not what I am after. I don’t regard the streets as a space for intimacy but for immediacy. I meet my subjects head on. I spot them fast and photograph them even faster. Depending on their size and my proximity, I sometimes frame and shoot at waist level, which results in drastic and occasionally unforgiving angles. Life is unforgiving and the street has its own pace, which I intuitively follow. It is not a soft-hearted method but it isn’t callous either. I feel that one challenge for a street photographer is to strike a balance between the blatant and subtle. Turning the street into a stage is not the same as turning it into a zoo, into a spectacle of the carnivalesque where human subjects are robbed of the slightest shred of dignity, turned into caricatures so visually and ideologically distorted that their sole purpose in the image is to arouse sensation. Like all sensation, this kind is bound to satiate then leave empty, only to return, but it is short lived. A touch of subtlety cannot hurt even the most blatant photograph and it is found more often in questions than in exclamations. Do you work on any other projects at the moment? I am working on a couple of projects. One of them is my next book, a sequel to “48 Hours Blackpool”. It is a somewhat darker series where the ‘real’ Blackpool locals are in focus and not so much the promenade crowd. The other project I’ll be shooting in the Middle East. Hopefully in my next book! 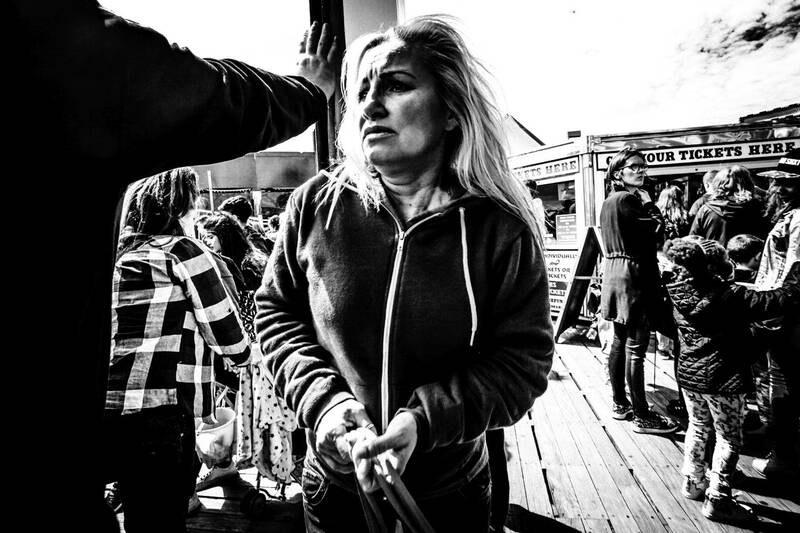 I also have a big solo exhibition of “48 Hours Blackpool” opening on March 29th at the Willy-Brandt-Haus in Berlin. The exhibition will be on until May 12th. On my website www.benitasuchodrev.com you will find different samples of my work, past and present.